This is THE Nantucket basket for toting those casseroles, cakes and other goodies in absolute high-class style! And a new Nantucket basket style for those who collect (and use!) Nantucket baskets. Measuring 17" long x 10" wide, 3.5" high to the rims and 5" high to the handles, this sturdy Nantucket Casserole Basket Tray carries it all. This Casserole Carrier Nantucket basket features a wide cherry wood base, decoratively routed on both the inside and outside edges. Eight 1/2" wide cherry wood staves are symmetrically placed around this basket, giving beauty, stability and a very contemporary look to this fine Nantucket basket. Hand-beveled and hand-tapered cane staves are inserted into the fine thin groove cut around the base. Nantucket-grade cane weavers are tightly woven and packed down tight. Heart-shaped Nantucket basket handles (cherry or oak) on the ends of this basket are hand-carved from sturdy hardwood, steam-bent to shape, and sanded multiple time by hand to esnure a smotth glass finish, giving this basket a very elegant feel. Woven down into the weaving of the basket along a cherry wood stave, the basket handles are further secured by a brass escutcheon pin through the rims. The cherry wood base on this Nantucket basket has been routed to accept an ivory scrimshaw disk. (shown is one disk depicting Nantucket Island in a nautical motif). 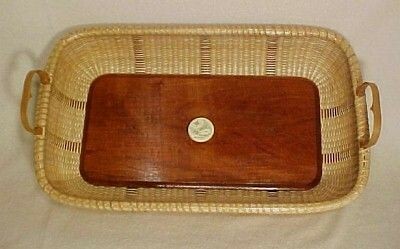 As are all of my fine Nantucket baskets, this Nantucket Casserole Lightship Nantucket Basket Tray has been given multiple coats of varnish by hand, with all of the wood parts hand-burnished to a glass-smooth finish both top and bottom. Only the finest Nantucket basketmaking supplies were used to craft this basket, and I have signed and dated the base. Although I am no longer accepting orders for the Casserole Carrier Lightship Nantucket Basket Tray, I do craft one or two of these per year. When its ready for sale, you can purchase it directly from my Simply Baskets website.